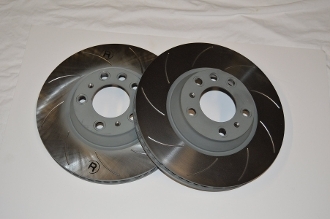 Slotted Brake Rotors now for the late 996 Cup and the 04-05 GT3 Street cars. Slotting eliminates the issues of cracking between the cross drilled holes that shows up with factory rotors. Made from high quality German rotor blanks, slotted to Demon Speed Motorsports specifications, these rotors have slots which are made to be deep enough to last the life of the rotor. The rotors are zinc coated.